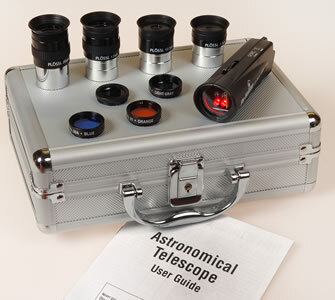 Sky-Watcher Eyepiece, Filter, Night Vision Torch Set for just £89.00 (SRP £149.00) directly from OVL!! Just send a photocopy of your receipt with a cheque (payable to OVL) and covering note to us at the address below. Order must be placed within FOUR MONTHS of telescope purchase. Please provide a daytime telephone number and an address, for guaranteed acceptance of delivery, between 9am-5pm Mon-Fri as the goods will be delivered by carrier. FREE delivery to any UK address! !